Frank Spencer, Flynn Westaway, Katrina Meek, Kendrick Louis, Evelyn Curtis (mother of Nina Curtis). 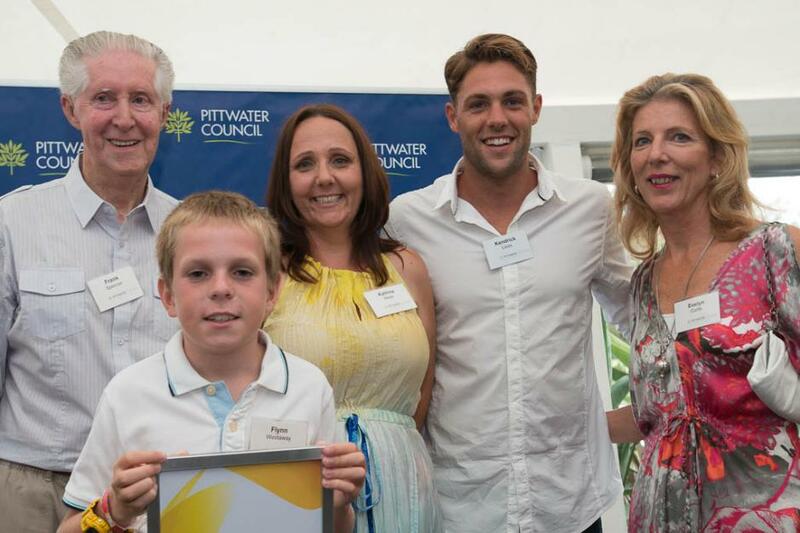 The winners of the 2014 Pittwater Australia Day Awards were announced at an awards reception on Thursday 23 January. There were three award categories under which nominees were selected; the Pittwater Citizen of the Year, Young Citizen of the Year and Sportsperson of the Year. The awards were presented by Pittwater Mayor Jacqueline Townsend at an awards reception at the Inch Café, Mona Vale. Katrina Meek was selected as Citizen of the Year. Katrina was responsible for forming the ‘Mums for Mums’, a Newport-based community group which supports local families with seriously ill family members or who are dealing with other crises. The group was originally set up to help raise funds for Katrina’s friend who was diagnosed with a brain tumour. Fundraising has included an outdoor movie night coordinated by Katrina last year. To date, ‘Mums for Mums’ has helped 15 local families. Pittwater’s Young Citizen of the Year is 11 year old Warriewood resident Flynn Westaway. Flynn is a regular fundraiser for the McGrath Foundation, donating all the proceeds from his Saturday car wash to the charity. Flynn is also in the process of organising a donation drive at his school for a family who lost their mother. In 2014 the award for Pittwater’s Sportsperson of the Year has been shared between two recipients. Kendrick Louis from Newport has been a star performer in national surf lifesaving titles. Kendrick has taken out the Australian Junior Ironman Championships on three occasions and last season received a gold, silver and bronze medal at the Australian Championships. He also attained second place in the high profile Kellogg’s Nutri-Grain Ironman series. The other joint winner in this category is Bilgola Plateau’s Nina Curtis, who began sailing on Pittwater with her parents as a toddler. Nina has gone on to win a gold medal in the World Championships in Sweden in 2009 and more recently was a silver medallist in the London 2012 Olympics. Named 2012 Australian Female Sailor of the Year, she is currently campaigning for the 2016 Olympics in Rio de Janeiro. In addition to the winners of the Australia Day Awards, Avalon resident Frank Spencer was recognised with a special Pittwater Achievement Award. Frank was one of the founders of the Pittwater Australia Day Breakfast on the Beach that has been taking place every year since 1988. Mayor Jacqueline Townsend extended her thanks to the individuals involved for their contribution to the Pittwater community. “I’m extremely proud of these great people whose involvement in our community makes a difference to so many,” she said.